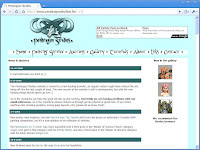 The purpose of this blog is to showcase my work and to share my knowledge about the hobby. But I also get a lot of inspiration and motivation from it. Knowing that hundreds of people are reading my blog posts really help to finally get that figure from the workbench into the display cabinet and to keep improving myself. 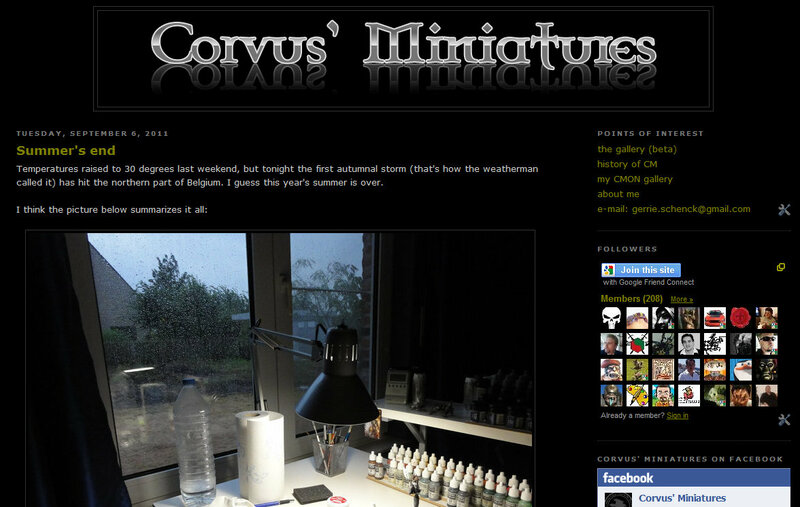 The roots of Corvus' Miniatures date back to 2003, but I've been blogging since 2008. Scroll down to the history section to read the full story. My name is Gerrie Schenck and I live near Antwerp, Belgium, with my girlfriend and two daughters. I work as a software engineer. I've been into scale modelling since I was a kid. When I finished school in 2001 I was introduced to Warhammer 40K. Soon I found out that I enjoyed painting more than gaming, so I decided to expand my skills towards that direction. The hobby became more serious, I started competing in painting competitions (and winning some too), and doing commission painting. The last couple of years I'm unable to put as many hours into the hobby as I used to do, but in a way I think I get more satisfaction out of what I do. A lot of motivation is drawn from this blog, and the response from the community. If you want to read a bit more about my miniature painting carreer please scroll down to the 'history' section. When my family and I moved to our current house in 2010, I had the luxury to have a spare room which I could use for painting. I decided to go for a two desk setup, one for painting, the other for assembly and basing. A dedicated photo setup and a display cabinet really turned it into the painting studio of my dreams. In 2001 I picked up a Warhammer 40K starter paint set after I was introduced to the game by a friend. I built a Space Marine army, and then some Tau. Soon after I got involved in my local gaming store: Celtic Cross in Antwerp (which unfortunately closed down in 2010). People there played a curious French game called Confrontation by Rackham. This was really something for me: small armies with gorgeous miniatures. After painting my first few Space Marines it didn't take long to find out there was a huge community and lots of resources online. I frequented the CoolMiniOrNot forums, and then the old HeadBlast. 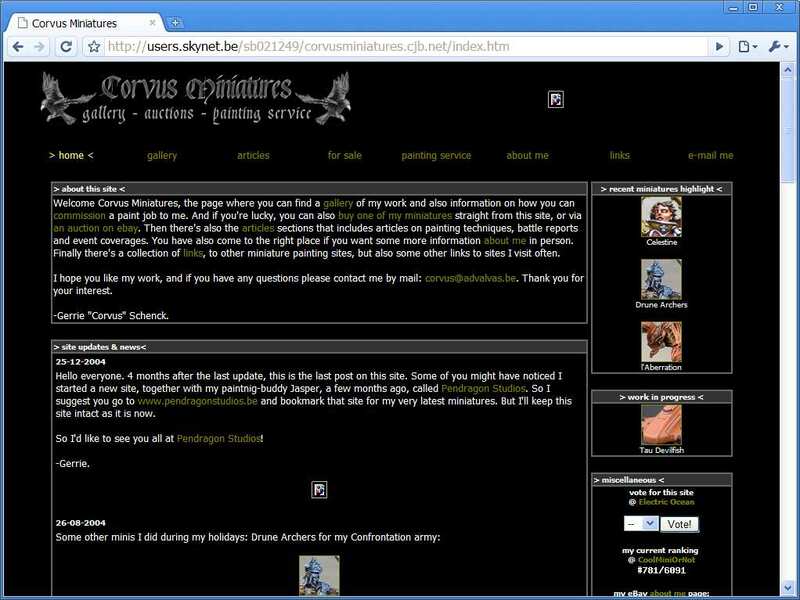 Sites like TinctureAdept (now MiniJunkie.com) and Jenova's homepage inspired me to create a webpage for my own: the original Corvus' Miniatures was born. You can take a look at the original version here. Besides launching my own site, 2003 was also the year of my first painting contest. By now I had sold all of my 40K figures so I entered a Rackham figure which I didn't paint for my army, but just for display purposes. To my surprise I got second. I promised the jury to return the year after and so I did, winning gold in the single mini category. At the same time I started doing commission painting. I sold a lot on eBay, and from the various forums I got quite some requests to paint figures for people from all over the globe. 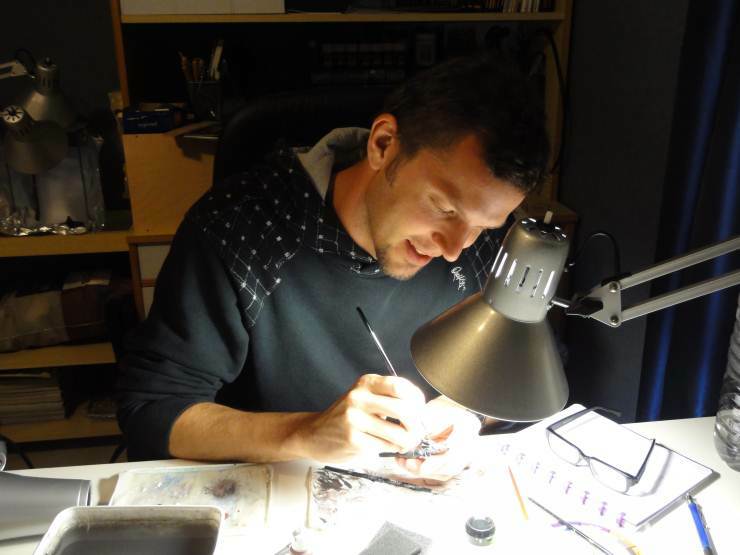 The hobby became more serious: more commission work kept coming in and the competitions got harder. 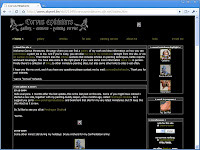 Because of this I wanted a new, more professional looking site. In 2004 I met Jasper Posson, a talented painter and great a person overall. 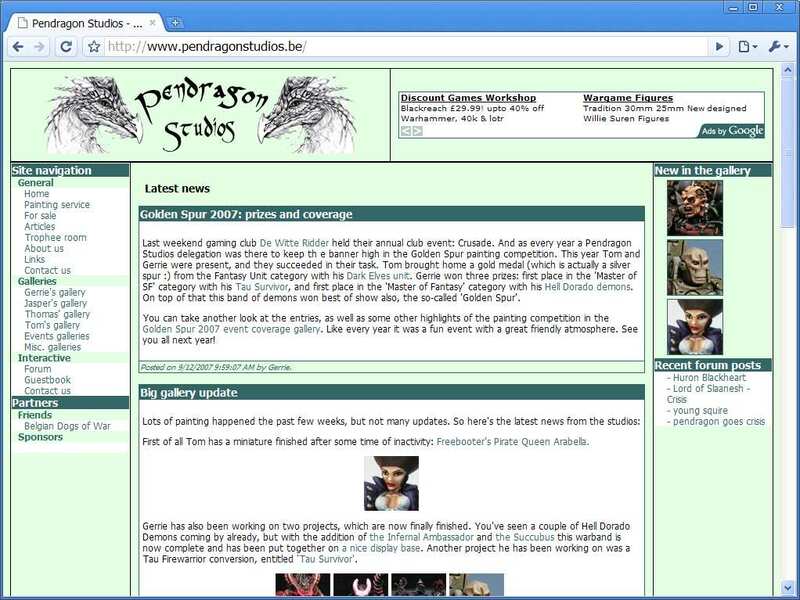 Together with him I kicked off a new site, called Pendragon Studios, later that year. We worked together for commissions and competitions, some highlights included our showcase at Miniaturansichten 2005, Jasper's silver demon at the German Games Day 2006 and my best of show award at the Golden Spur Painting Competition 2007. 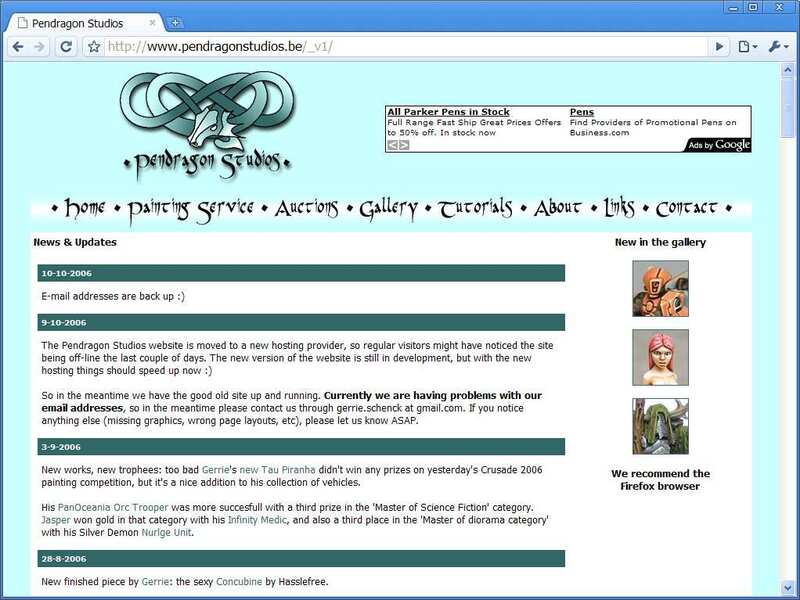 In the meantime the Pendragon Studios website was reworked and the team was expanded with two more painters. After those glorious times some things changed radically. First of all my oldest daughter was born. This marked the beginning of some of the happiest times in my live, but hobby-wise I was faced with the fact that I couldn't put that much time in the hobby as I used to. My motivation dwindled, I decided to quit doing commission painting and started neglecting Pendragon Studios. The other three guys lost interest as well, so I decided to close down that project. I forced myself into painting miniatures for competitions which naturally resulted in a lack of quality. I lost a few competitions and got seriously demotivated, even thinking about putting down the brush for good. 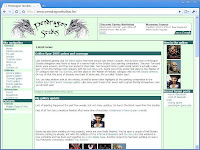 To save myself from quitting this fantastic hobby completely, I started the blog you see now, late 2008. I said to myself: "paint what you want, be it showcase or gaming quality, and don't force yourself into anything". I found the pleasure in the hobby again, and used the blog to draw motivation. In 2010 I moved to a new, bigger house which allowed me to build the painting studio of my dreams, which you can see in the 'my painting desk' section. Work in and around the house occupied most of 2010 and 2011, but I kept on improving my painting skills, trying out new techniques on the few miniatures I painted during those times. In 2011 I became a member of the international Chest of Colors painting team. A little while later my blog was reworked to what you see now, receiving a new logo, a sleeker design, and some stand-alone pages like the gallery.